Patriot Machine Inc. specializes in producing intricate parts and assemblies for the aerospace industry. Vice president Bob Burns prides himself and the company on innovation. That’s why when increased demand for better fuel efficiency in the aerospace industry led to the use of more titanium parts on aircrafts, Burns saw a need for machines that could handle the rigors of the tougher metal, and adapt to the changes happening in the industry. This St. Charles, Mo., company traditionally used 5-axis vertical machining centers to generate their titanium parts, but Burns says both operators and engineers faced a number of difficulties when developing newer complex part designs. Knowing that true innovation means working without limitations, Burns set out to find machines capable of the task. After surveying the machining landscape, Patriot Machine revisited a friendship it had established with Makino’s MAG3 machines, and the company decided to get more information about Makino’s T4 5-axis horizontal machining center and T2 6-axis horizontal machining center. The T-Series machines employ ADVANTiGE technology and are the first built explicitly for titanium machining and aerospace components. 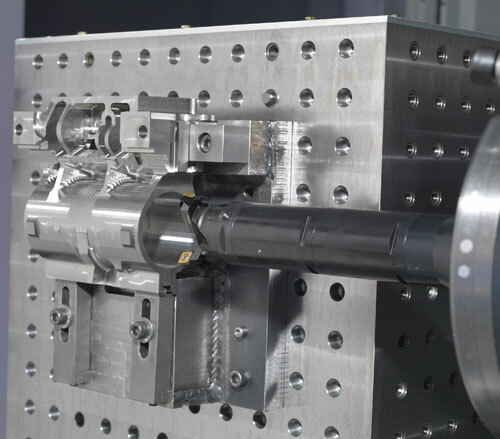 ADVANTiGE technology uses flexible and powerful spindles and Collision Safe Guard technologies, an advanced high pressure, high flow coolant system, vibration dampening system and a rugged machine construction, all designed to increase productivity and increase tool life in titanium machining. Thanks to the T-Series machines and ADVANTiGE technology working as one, Patriot Machine has vastly improved on its production time and overall quality of its intricate stainless steel and titanium parts. Without limitations in manufacturing, the design teams at Patriot have turned assembly designs into monolithic structures, thus enabling OEMs to reduce an aircraft’s overall weight, and improve fuel efficiency in the process. Improved mobility has Patriot gaining contracts others simply can’t do. One recent contract required part work on a plus or minus 45-degree tool rotation. Previous production methods would have called for numerous setups and fixtures, but thanks in part to the T-2’s 6-axis capabilities and unlimited B- and C-axis rotation, the company was able to combine multiple steps into one, all while completing the part with improved accuracy. Now with the competitive edge they strive for, Burns and Patriot Machine look to continue to advance as titanium innovators. The company is seeking to expand with new machines, including two additional T-2 machines, have a T-4 arriving in the fall and expect to order another in the near future.